Cryptocurrency is drawing the wrong conclusions from the dotcom bubble. It’s smart to study history. Few do it right. Lately, we’ve seen some flawed interpretations of the dotcom bubble of the late 1990’s. Those flawed interpretations misinform us about the cryptocurrency markets of today. Don’t let them. It will cost you money. Starting with the wrong assumptions: Even if we’re in a bubble, the only direction for the long term is up. The narrative goes something like this. These two stocks (Amazon and Apple) looked like they took a huge dive in early 2000. But that was only relative to their prices so far. When viewed over the long term, it was a minor bump on their eventual road to blow-out greatness. The flawed conclusion is that cryptocurrency stocks will do the same thing. We might see a bump in the bubble, but in the long run they are great investments. There are a lot of things wrong with this thinking. 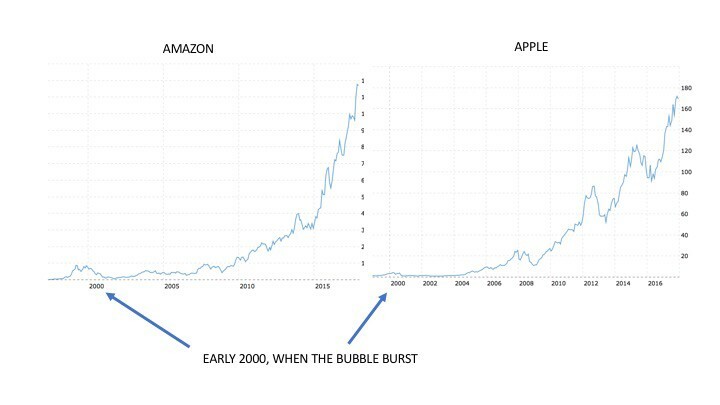 Now Amazon is — without question — the single best example of a dotcom bubble success story. And yes, you would have been wise to own it and hold it from 1998 to 2018 through the ups and downs. You would be much richer today if you had. Apple, on the other hand, was not an Internet stock at that time. Apple in the late 90’s was a struggling maker of computer hardware with no credible Internet play. Evangelists of the dotcoms had no time at all for Apple in 1998. Apple didn’t even begin to matter until at least four years later. It is misinformed to include Apple in any such analysis. Apple was never a dotcom. Saying Apple in 1998 was a dotcom would be like saying IBM in 2018 is a cryptocurrency. No self-respecting believer would have owned it. These were huge. These were the Ripple, the Dash, the ZCash, the Monero, etc. of their day. You were a shithead if you didn’t know and own them. Recognize them? Maybe a few. Use them today? Of course not. They were gone after the bubble. Gone. And there were hundreds more. But owning just one winner makes up for lots of losers. So diversify and you’ll be fine. Right? True. One serious winner with 25x or 100x gains will make up for a multitude of clunkers. If you happen to own the one winner. And if you don’t squander your 3x, 5x, 10x short term gains. The one survivor that everyone points to from the dotcom days is Amazon. But remember, by 1999 Amazon had an actual business with millions of users. Early days yes, but in 1999 Amazon was a useful new way to do something people previously did anyway. Amazon was showing real conversion to the new way. That is not true for one single company today in cryptocurrency. Not one. There is no practical use, no real need, for any of it, not even for bitcoin. I agree there will be in the future — but today there is not. If you don’t believe me, go try to use one of the crypto-powered services for video sharing or data storage. What you’ll find is vaguely functional prototypes at best. WAY too early for investors to take seriously. Way. Too. Early. In 1999, Amazon’s strategy was emerging and it was well on its way to changing how we shopped. All we have today with cryptocurrencies are hypothetical use cases that could one day change the way we do things. None of them actually do it yet. During the dotcom bubble, lots of worthless stocks soared 200%, 300%, 600% and more. Many investors took a round trip from zero up — and back down again. Smart investors took some of the gains off the table on the way up. Did they worry about selling at the top? Hell no. Smart investors know they can’t. Smart investors know that when something with no clear value hands you a 500% gain, you take some money and put it in your pocket. That way, you can reinvest those profits later on. That is how you get rich in a bubble. Not by buying a bunch of junk and sitting on it. A portfolio of different kinds of crap is not diversification. It’s several small piles of crap. You didn’t have to be a genius in 1999 to know that eToys, Pets.com, theglobe.com, etc. had no real business. If you owned their stock and watched it triple, good for you. If you sold after the triple, even better for you. When the crash came it became clear which companies were worth owning. If you were really smart you bought after the crash, using your profits from selling the crap before everyone else realized it was crap. Or — you could always hold on to the crap and let it go back to zero. Your call. Many did. In the dotcom days, the problem wasn’t excitement. It was too much excitement, too early — just like with cryptocurrency. What about the other big names in tech today? What if you had held them through the bubble? Google, Facebook, Netflix ? They didn’t exist (or in the case of GOOG and NFLX, weren’t public so you couldn’t buy them) during the bubble. There was still too much to learn. Same exact thing is true today. And remember Apple? It was a complete outsider in the early Internet boom, it wasn’t part of the story until later. We are still figuring out exactly how blockchain technology is going to commercialize. The fact that there are no commercially functional cryptocurrency applications should tell us something. The best cryptocurrencies likely do not yet exist. Rest assured, the real winners of 2025 have yet to emerge. Not to mention, we have no idea what kind of indirect opportunities will follow as cryptocurrencies mature. Infrastructure companies were huge gainers when the Internet really took off. After the bubble. When the serious business began. In the dotcom days, it was uncool to care about profits. Sound familiar? Cryptocurrencies and ICO tokens resemble real businesses even less than early dotcoms. I know this may be hard to believe but it’s quite true. In 1998 and 1999 you were a complete loser if you so much as brought up the question of profits. Dotcoms were all about how the Internet would change everything. The potential was so big, you were a fool to fuss about profits. It was all about staking out early ground. In 1998 it was impossible to go to a party without meeting some guy willing to shout you down with his rant about how Cyberian Outpost or eToys had the business model that would change everything. Fast forward to 2018 and that guy is expounding on how Ripple will change interbank finance or how bitcoin is the new dollar. Do yourself a favor. Listen and smile. Own a modest amount of these cryptocurrencies, sure. It’s a good place to put a little money you never care if you see again. If it grows 10x then perhaps sell some and take profit. Reinvest that profit in something safer. Or buy yourself something nice. And wait. Sell when you see huge multiples on your investment. Buy when everyone else is crying. Most of the people with huge gains in cryptocurrency have never experienced this before. Huge growth tends to cloud judgment. That’s OK, any good bull market needs a healthy crop of fools. Good discipine suggests taking profits if an asset with high volatility and limited liquidity returns 5x or 10x. Sure — it might go up more. But it already went up 5x or 10x and most venture capitalists work their butts off for those kinds of returns. But if you do sell, don’t forget what you learn in the early days. Some of these things will have lasting value. As an early participant you are well positioned to pick them again when prices are lower. Prices will drop, bargains will appear. Don’t let irrational exuberance keep you from setting aside money to buy when irrational dismay sets in. The emperor is naked. Tell your friends. I’m a curious nerd and I truly believe that blockchain and cryptocurrencies are here to stay and will change the world. But selling digital tokens for services with no more than words on paper is too much about lofty ideas and not enough about real solutions. I’ve yet to read an ICO white paper that is not naive puffery at best, outright chicanery at worst. It’s bound to end badly. The crypto/blockchain world has gotten way over its skis. Many people who are lucky enough to hold profits from their early speculation will fail to take them. And those profits will go back to zero. That’s a shame. As a believer in the long term for blockchain and crypto, I prefer to bank some profit now so I can use it to buy again later when prices drop. Believing in something new should be rewarded. Exploiting belief, not so. The opinions expressed here are just that — mere opinions. I am an individual and I neither give, nor seek, nor profit from, investment advice. This opinion column is to encourage thought and debate. Nothing more. Any decision you make to buy, sell, not buy, not sell, or do otherwise are yours and yours alone. You alone are responsible for the consequences of your actions. As always.